The Martin Mania EF2 is the new cool dance floor lighting effects suitable for DJs, clubs, events or even your own personal party. • 800 hour lamp life! With 19 beams of light, a manually selectable gobo wheel, 8 gobo patterns, (4 with color coated structure glass and 4 with dichroic color filters), the EF2 is an awesome new member to the Mania family. A variable focus also allows you to frost any effect and an optional sound activation keeps patterns moving to the beat. Like all Manias, the EF2 has incredible stamina with no duty cycle, meaning there are no cool down periods and no stopping the show. 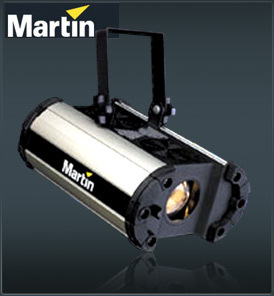 Utilizing the Martin technical know-how which comes from lighting the world’s largest shows, clubs, tours and concerts, the Mania EF2 outshines its peers in brightness, clarity and functionality, and all for revolutionary prices. Giving you a clear passage to the tools you need to color your show, club or party.